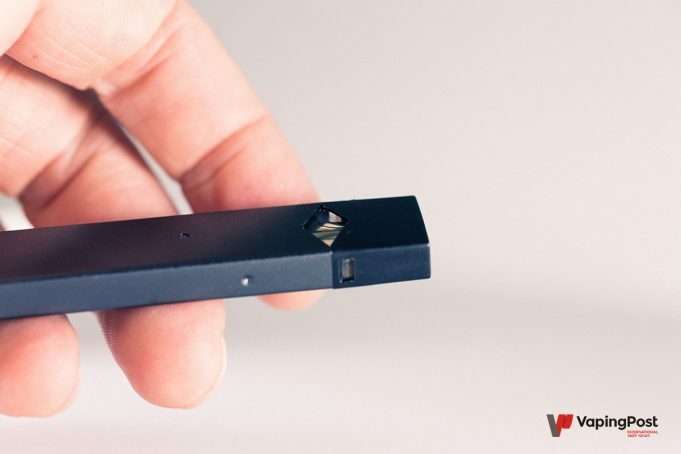 Juul is a pod, what am I saying, THE pod that American vapers have taken to the top of the vaping market. It is a simple, well presented product, which uses eliquids up to 59 mg/ml of nicotine in the United States, and is supported by a remarkable communication, which values users. 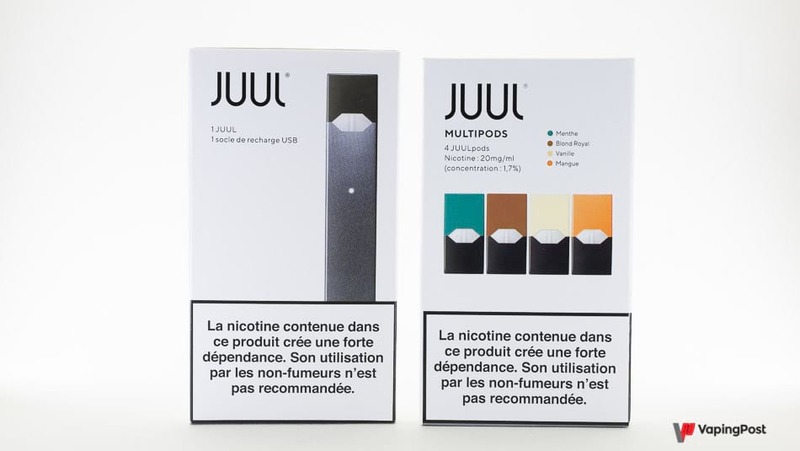 The arrival of Juul in Europe is therefore having a small media effect, it is now up to us to see what this pod is really like, with e-liquids limited by the regulation to 20 mg/ml. 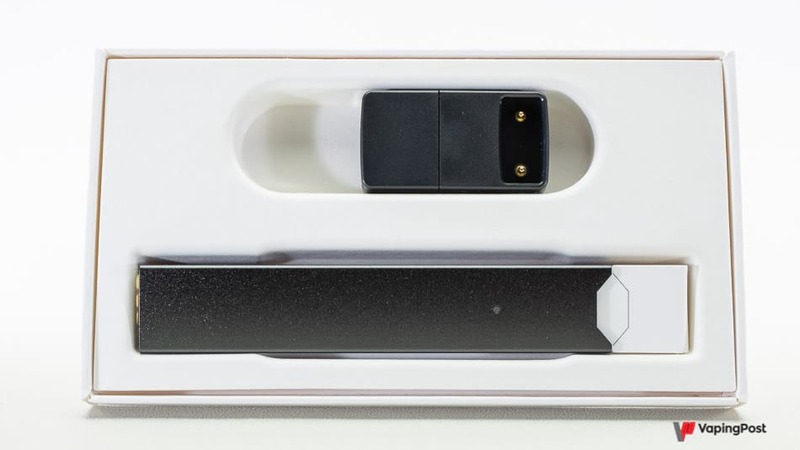 Like the KoddoPod Nano (Le French Liquide), AXS (Alfatech), or MyBlu (Fontem Ventures) to which we will have to compare the Juul, this pod is a complete system that allows users not to worry about anything. The pod is automatic, the e-liquids are proprietary and sealed in cartridges. We don’t have to choose them from hundreds of references, we don’t have to change the resistance, everything is simple. In addition, the mod works in temperature control, and indeed, if you take a few puffs when the cartridge is empty, nothing happens: no dry hit. 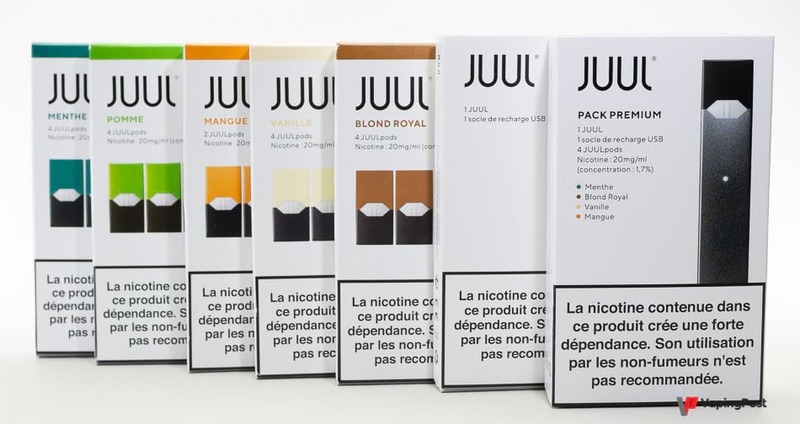 But Juul goes further in simplicity: the brand does not communicate on the capacity of its battery, nor on the value of its coils or on the power, and it is necessary to look to know how much e-liquid there is in a pod. With Juul, the technique does not exist. 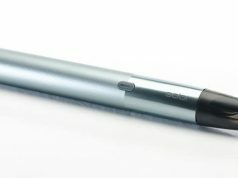 The brand announces 200 puffs… full stop! “Don’t worry about anything, don’t try to understand, we take care of everything, trust us”. That’s smart, but we want to understand! 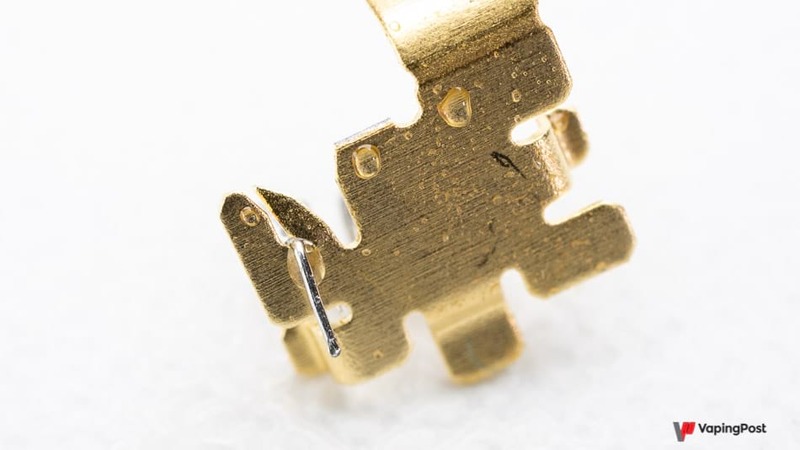 Not backing away from any sacrifice, we dismantled everything to access the technical specifications. – A basic package with the body (battery), USB charger and instructions for use, but no cartridge. – A “premium” pack, with the same thing and a box of 4 cartridges of different flavours. The cartridges are sold in packs of 4 (sometimes 2), and offer 5 flavours: Royal Blond, Mint, Mango, Apple and Vanilla. In Europe, all are dosed at 20 mg/ml in nicotine salts. 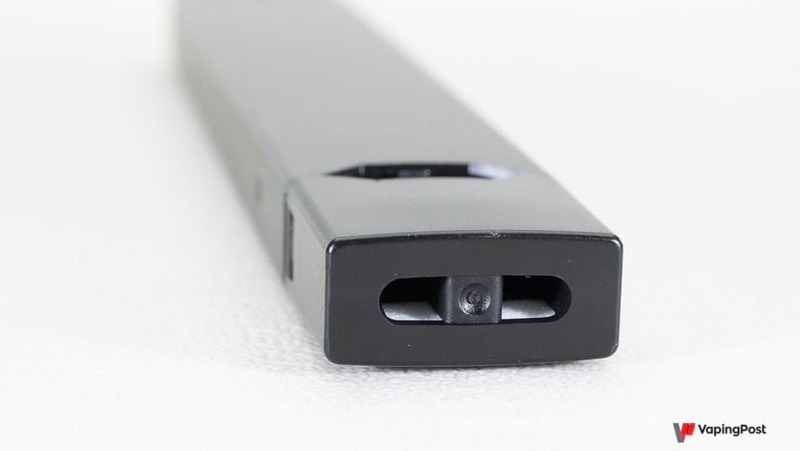 Juul is a small pod in “pen” or “USB key” format, in which you just need to clip a cartridge to vape immediately. 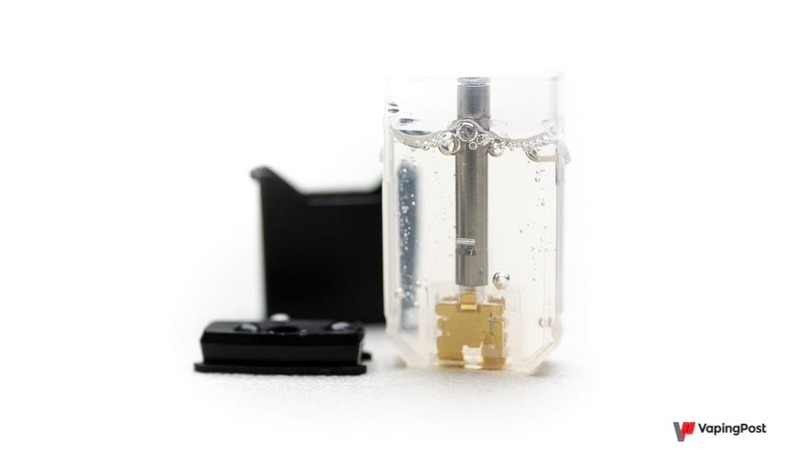 The finish of the pod is simple and of good quality: the body is made of anodized aluminium, the cartridges fit perfectly, with a firm and reassuring click. In this respect, it is one of the best pods on the market with the KoddoPod Nano, the Akso by Hcigar, the Vladdin RE or the Infinix by Smok for example. 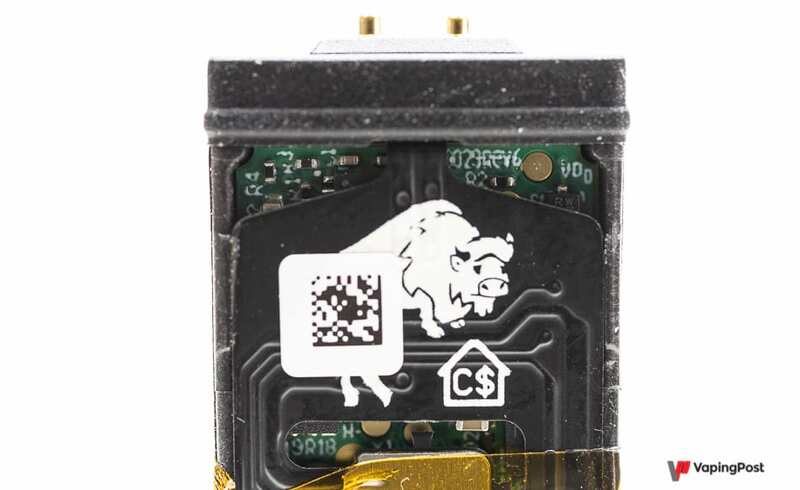 It even has one more thing: a proprietary connector for charging, less fragile, and which gives a less homemade look than micro USB ports. The battery recharges very quickly (30 minutes) because it is small, we will come back to this later. 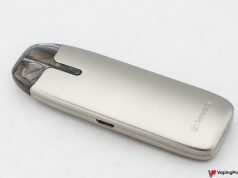 The charger is a kind of USB key, the pod fits on its base with a magnet. Very classy. This is a typical use of this pod. 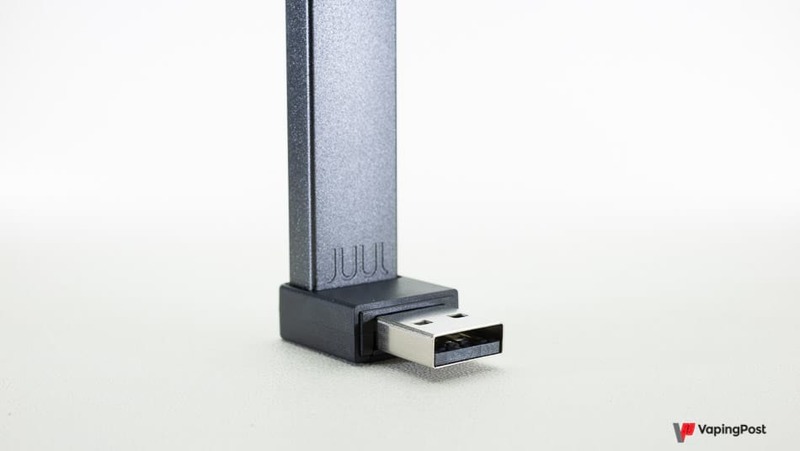 On your computer, whether at the office or at home, we go and, from time to time, you put your Juul back on his stand, so that it is always charged. On the other hand, when you want to charge it with a smartphone charger for example, it’s less convenient. And it is very, but really very easy, to lose it (the brand sells it by the unit). 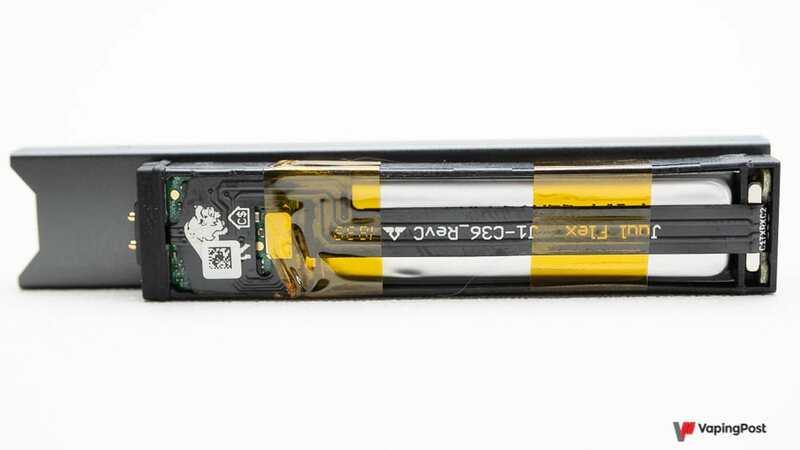 On one side, a white diode indicates that the pod is on when you vape. By tapping twice on the body of the pod, the LED lights up green, yellow or red to indicate the status of the power reserve. It’s very chic and it’s a good idea. 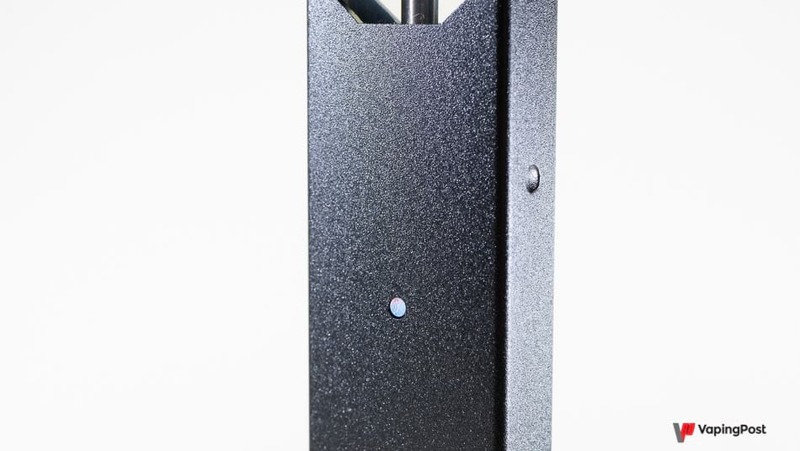 The Juul is a successful pod, very well thought out and built, which offers class and simplicity, aesthetically and practically. Vaping on a Juul is similar to vape on any other pod in the same format. The tip is square, but no less ergonomic than those with more oblong shapes. Inhalation is tight, very close to the drag of a regular cigarette. As on the other pods, it is possible to change flavor on the fly, just change the cartridge by putting on its protection, to come back later. A typical use is to have a kit with a few spare pods. 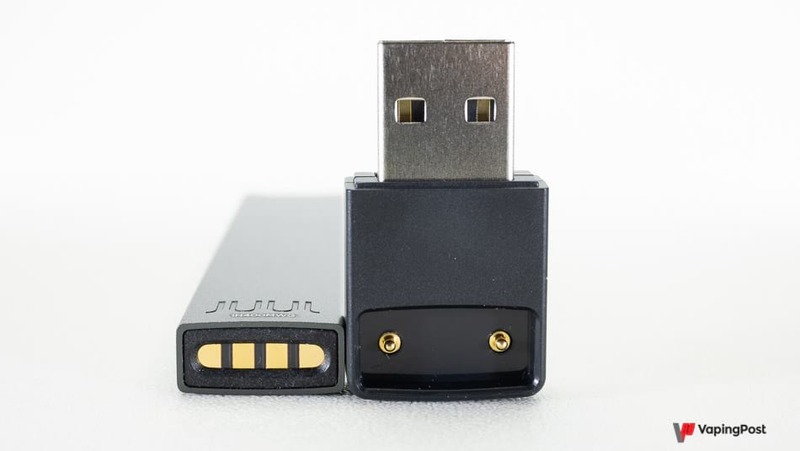 Moreover, there are dedicated kits and even power banks (external batteries) that can accommodate two Juul and a few cartridges. The flavours are quite pleasant, but not very intense, sometimes too light: mint, for example, is not fresh and its taste is tenuous. Some people may like it, but it clearly lacks sensations. The hit varies according to the flavours chosen, for example it is more present with Mango or Blond (tobacco) liquids. But it is always light, too light. A light throat hit is not necessarily a defect, since some beginners find the hit unpleasant, but this is too much. The KoddoPod for instance, which I found very soft, still gives more sensations, not to mention other pods like the Lynq or the Vladdin which offer a real hit with liquids also available in 20 mg/ml of nicotine salts. 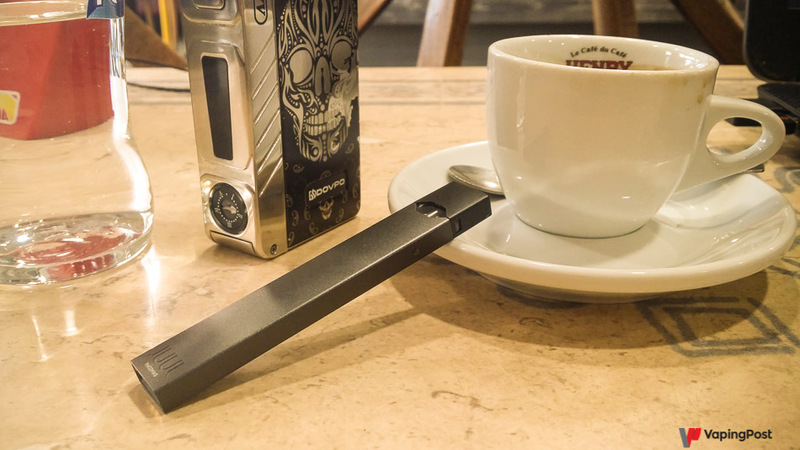 But more importantly, by vaping only on the Juul, I gradually felt a lack of nicotine, despite the sequence of cartridges and the regular charging of the battery. This is the first time it has happened to me with a good quality pod and liquids measured in 20 mg/ml. I usually use liquids in 6 mg/ml as very moderate indirect inhalation. And when I go on 20 mg/ml pods, I tend to vape less. 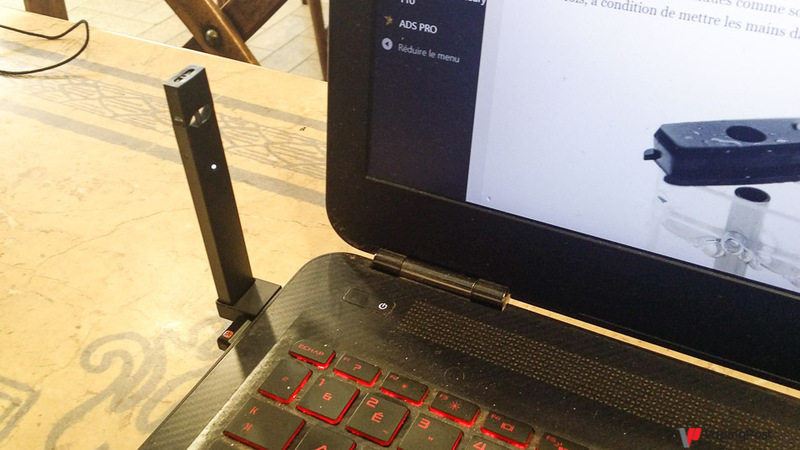 With Juul, it’s the opposite: it’s not effective for my personal use. 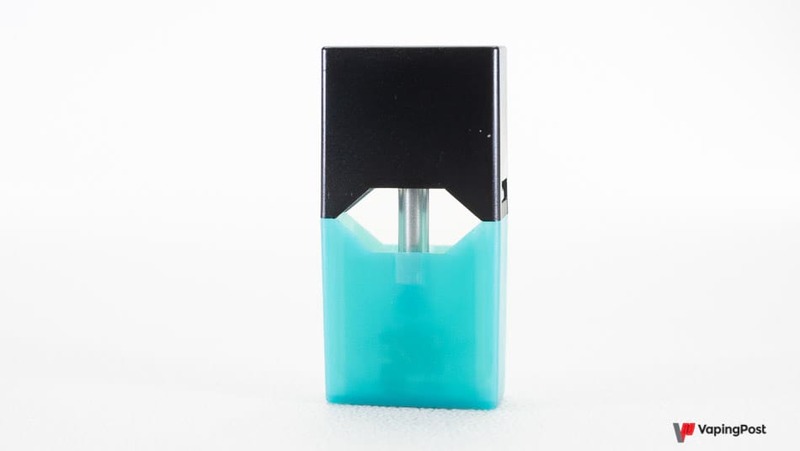 As Juul is intended a priori for smokers who want to quit smoking, who therefore need a good dose of nicotine at the beginning to wean themselves off smoking, it is a real concern, which can, in my opinion, lead to failures during smoking cessation. As a result, it is worth further objective investigation of the device. We just need to analyze its autonomy to understand. The brand announces 200 puffs, both for the battery and the e-liquid contained in a cartridge. But, if it is true that a cartridge empties at about the same speed as the battery, there are not 200 real puffs. When I calculate an autonomy for a device I have to review, I count 4-second puffs, which is generally appropriate in mouth-to-lung inhalation (MTL). So let’s calculate. 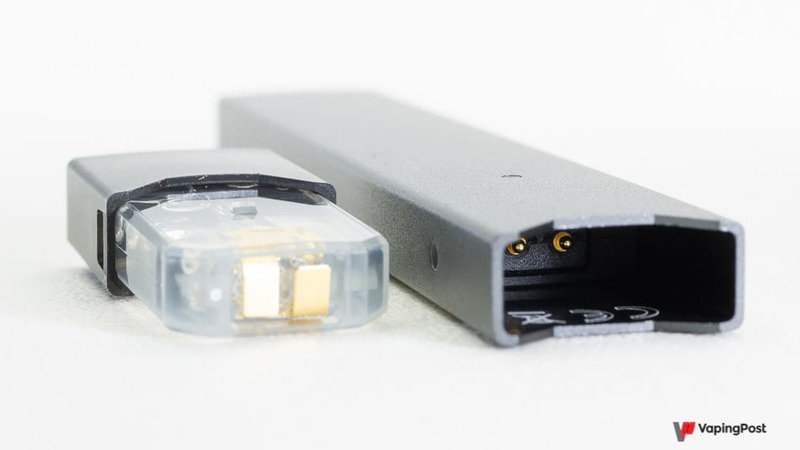 With a capacity of 200 mAh and a nominal voltage of 3.7 volts, the Juul contains an energy of 0.74 Wh, which is well specified on the battery. 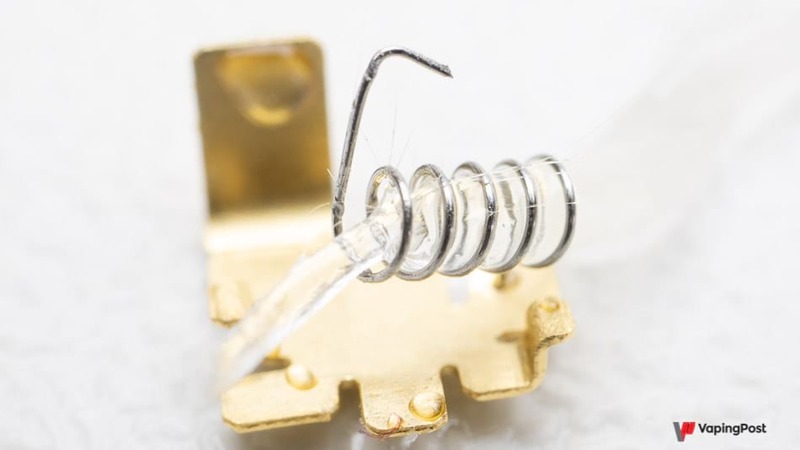 The coil is measured at 1.6 ohm, and if the battery was not regulated, we would have a power of 8.5 W. But there is an electronic regulation and a temperature control, so it is difficult to know at which power it really works: it must be between 6 and 8 W, which is consistent with the feeling. Then, the actual range in number of 4-second puffs would be at best 110 puffs at 6 watts, or 85 to 8 W. That’s the equivalent of eight or nine cigarettes. Obviously, if you take 2-second puffs, you double and you get around 200 puffs. However, with American levels of 50 mg/ml, puffs of 2 seconds may be enough, but not with a level of 20 mg/ml. In short, Juul was designed to be satisfactory with very high nicotine levels, and the hit is much more satisfactory with a 50 mg/ml liquid. But with the maximum rate allowed by the TPD in Europe, Juul shows its limits: bland flavours, insensitive hit and limited satiety: those who do not need much nicotine will be able to be satisfied, but not smokers undergoing withdrawal. 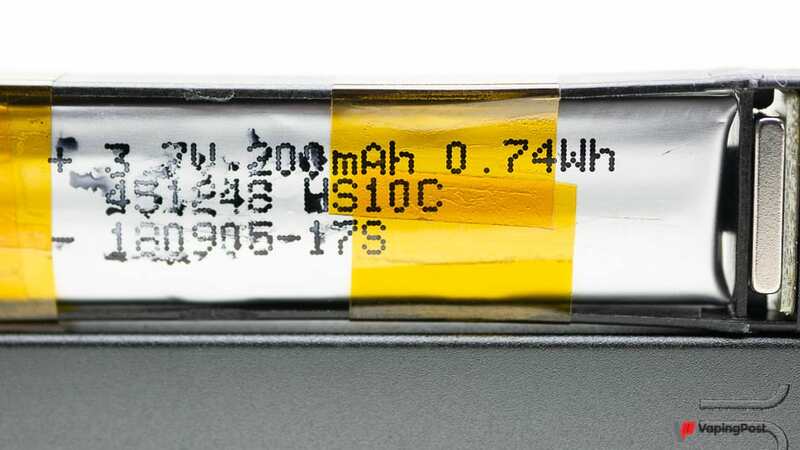 Moreover, in these conditions, the battery does not last half a day, so it is essential to have two batteries AND to be able to recharge them during the day. Not only is Juul not, in my opinion, a very effective pod, but it is also amazingly expensive to use. Let’s compare what is comparable, 4 similar pod systems with sealed cartridges. 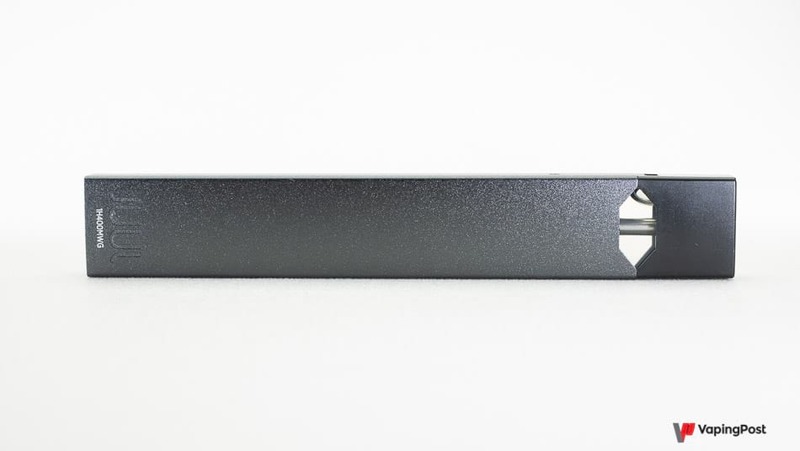 The Basic Juul pack, without cartridges, is just under €30. This is also the price of a KoddoPod Nano, but with 3 cartridges, or an AXS (Alfatech), without cartridge but with 2 batteries. The MyBlu pod is available for 20 €, without cartridge and with only one battery. We are in the same range, with an advantage for Alfatech which immediately offers 2 batteries of 650 mAh. Honestly, I checked the data several times because I didn’t believe in the price of Juul cartridges, but no, they do contain 0.7 ml of liquid for a unit cost of 3 €. I now have a better understanding of Juul’s financial valuation and the great interest of Marlboro’s manufacturer, Altria, in its performance. Here again, cartridges at this price in 50 mg/ml, it can eventually hold: it remains expensive, but we use less than 2 per day. With 20 mg/ml, we will use 4 per day instead, the cost is then delirious. Even if the cartridges are sold as sealed, it is possible to refill them a few times, provided you put your hands under the hood. 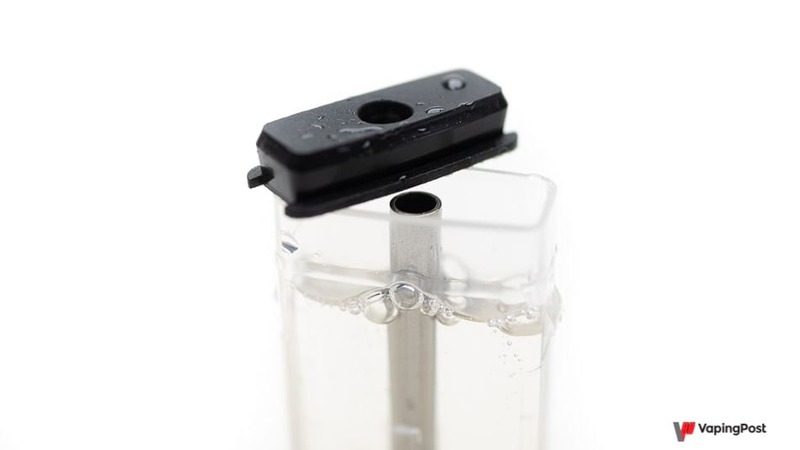 To do this, simply unclip the cartridge, using a small screwdriver, and remove the silicone cap to access the filling. That being said, I don’t see much point in doing that given the poor quality of the vape. There are less expensive and much more efficient refillable pods. But it is also an opportunity to notice that the system for maintaining the internal resistance of the cartridges is extremely simple. They even manage to avoid making welds, by simply jamming the wire into the metallic stand. It can’t be expensive to produce. On the other hand, the cartridges leak strongly when you change altitude: it is better to take them out of the pod when you travel by plane or when you go to the mountains. Under normal conditions, however, they do not leak, or very little: there is so little liquid that it was vaporized before it had time to escape! Low autonomy (100 real puffs). 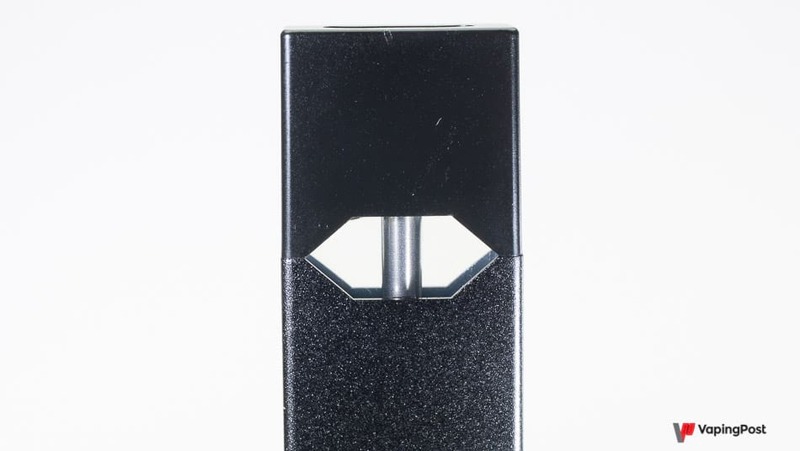 Juul is technically a good pod with a great usability, but its vape quality is not satisfactory in terms of sensations, nor in terms of satiety, whereas it should be efficient enough with a 20 mg/ml eliquid. It is an ineffective pod, which probably works with a very high dosage liquid in the US (50 mg/ml), but not with the limitations of European TPD. Finally, the cost of the cartridges, which brings the price of the eliquid to more than 40 € for 10 ml is hard to take, even more than MyBlu, that is to say.